You may have seen them: a procession of people seemingly all playing the same song as they paraded around the Mission last night. They gathered at Dolores Park and, at about 7:25 p.m., they all hit play at the exact same moment on an assorted variety of sound amplifiers. The music, a holiday ambient composition, filled the narrow side streets as they walked between 16th and 19th, only once stopping for a few minutes at Mission Dolores Basilica. They were all playing an original composition, Unsilent Night, created by Phil Kline in 1992. Kline composed Unsilent Night as a “multi-track electronic piece,” according to the event website. It is meant to be played in a group during the month of December, from boomboxes — though any kind of device that expels sound as loudly as possible is accepted and encouraged. The crowd of about 60 people last night was not only playing one song. It is a multi-track piece, so each participant had one track of the song. When played together in a group, the four tracks sync up to create the kind of musical ambience Kline intended. Unsilent Night is loud. But in a good way. If music could shimmer, Unsilent Night is what it would sound like. Each musical note seemed to blend with the next to form an almost hypnotic sound that loudly reverberated off the walls of buildings we walked past. Wherever the streets became narrow, the music grew louder. The streets of the Mission were alive and busy, but Unsilent Night seemed to overpower the hustle and bustle of a Saturday night. What began as a 50-person public event on a December 1992 night in New York City has become an annual holiday event celebrated across the world. This past week, it was held in Houston, Seattle, and Ontario, Canada. After last night’s sound medley in San Francisco, Sacramento and New York City are next on the list. 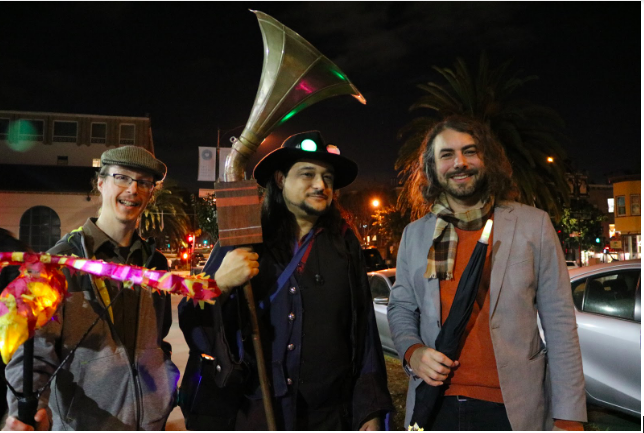 In San Francisco, Unsilent Night has been coordinated in the Mission since 2002, except from 2015 to 2017, when the San Francisco Contemporary Music Players took over the event, relocating the route from the Mission to Civic Center Plaza. This year, Josh Greene and Aaron Almanza brought it back to its original route in the Mission. Both long-time San Francisco residents, they have participated in Unsilent Night for years but have never led it. Modern-day Lloyd Doblers march in the Mission. Photo by Betty Marquez. “It’s supposed to be community-led,” Greene said, when asked about why the Contemporary Music Players were no longer organizing the yearly event. He added that he and Almanza appreciate the publicity the event received during that time, but both were happy to have it back on this side of town. It was Michael Garcia’s first time at Unsilent Night, but he was prepared. A friend gave him a large, bright yellow Pelican-brand case. He turned it into one of the largest sound amplifiers at the event last night. It took him about three hours to figure out how to build it and another three to create it, he said. A few yards ahead of him was Bao Tran, who seemed to be emitting the loudest sound in the crowd. It was coming from the blue and red messenger bag draped over his body. “It’s just a very large speaker,” he said, taking it out from his bag to reveal a black, and indeed very large, bluetooth speaker. The procession continued to head back toward Dolores Park, with some people holding their bluetooth speakers above their heads, in a sort of modern version of a Lloyd Dobler serenade to the Mission. Near the front was Catherine Palmer, who was holding a black speaker connected to what looked like a fourth-generation Apple iPod shuffle, a tiny and ultra-light audio player. She liked how “the sounds reverberate off the narrow streets.” She lives in Twin Peaks, and this is her second year walking to the sounds of Unsilent Night, which she described as harmonic. Back at the 18th and Dolores street corner of the park, the crowd gathered around Greene and Almanza as the final notes of the song played on the diverse audio players in the group. “Unsilent Night 2018! We will return next year!” Greene and Almanza exclaimed. The crowd quickly dispersed, but a few people stayed behind. Garcia, with his bright yellow homemade speaker next to him, continued playing music. Jackson Five, then Lionel Richie — the sounds of ’80s top hits filled the air. This, too, was loud. But in a good way. NextZoot suit riot: Siegel’s Clothing folds, and a community is exposed.